Those of you who know me personally already know of my obsession with lip products. Be it balm,salve,gloss,liners and lipstick- it doesn't matter I love it all. This year to add to my ever growing collection I found this incredible lip balm . 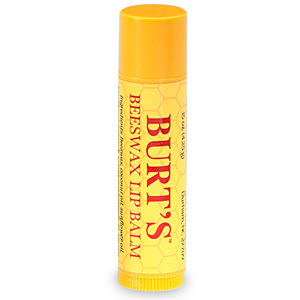 It's Burt's Bees Beeswax Lip Balm. This stuff is amazing. Sophia always gets really chapped lips in the winter and after using this balm for only 2-3 days her lips are back to normal. I have one tube on my nightstand to condition my lips while I'm sleeping. It has a delicious minty flavor and is not heavy and waxy like lip balms tend to be.